For fans of Joanne Fluke and Leslie Meier comes the second in Maymee Bell's delectable Southern Cake Baker mysteries. Sophia Cummings may be unlucky in love, but she knows that the way to a man's heart is through his sweet tooth. This evening, she plans to use that knowledge--and her skills as a New York City-trained pastry chef--to open the hearts and wallets of Rumford, Kentucky's richest men. Sophia, proprietress of For Goodness Cakes, has been commissioned to cater the Heart of the Town Library charity fundraiser at Grape Valley Winery. She's spent all her dough to make this a successful event, raise her profile, and win more plum catering jobs. At first, the going is as smooth as an elegant chocolate ganache. After nibbling Sophia's tasty treats, Ray Peel, the winery's landlord, announces he will pay off Rumford's library loan. But the evening soon turns decidedly frosty when Ray is murdered--before he can make good on his promise, and before he can pay Sophia for her catering services. For Goodness Cakes will collapse if Sophia can't collect what she's owed. So Sophia once again puts on her sleuthing apron to figure out who iced Ray. 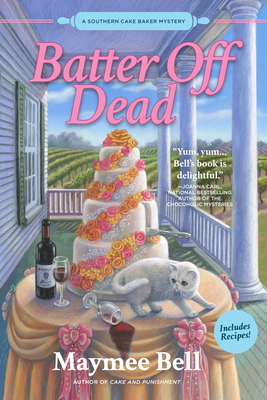 A glass of your favorite red or white is the perfect accompaniment to Maymee Bell's scrumptious Batter Off Dead―with authentic Southern recipes. Maymee Bell lives in Kentucky with her family and her two schnauzers. She likes strong coffee, slow-country days, and fresh-baked cookies―but she likes telling stories best of all. This is her second Southern Baker mystery.